Disclosure: This site receives a payment from Amazon, Naturepedic, Spindle, or Zenhaven when you purchase a product using any links to those companies in this article. One of the better materials being used in mattresses (and pillows and mattress toppers) is latex. Latex started to be come a big part of mattresses about a decade ago and many higher-end mattresses will use at least a layer of latex. Other mattresses will have latex as its primary ingredient. Here we will take a closer look at some of the pros and cons of latex to help you decide whether a latex mattress is right for you. As always, the two most important features of a mattress are comfort and support. For an in-depth look at how to check for comfort and support, check out my mattress buying guide, particularly part one. With that out of the way, let’s look at some of the pros and cons of latex. 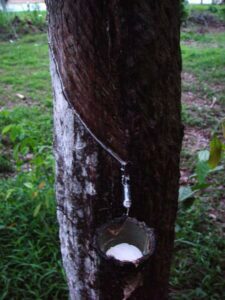 Latex being tapped from a rubber tree. This is processed into a foam by either the Dunlop or Talalay process to be used in bedding. Temperature neutral. Latex does not easily change its temperature (in scientific terms, it has a high specific heat; it takes a lot of energy to increase the temperature each degree). This means it does not sleep hot or cold, and the firmness is not affected by room or body temperature. This leads to less tossing and turning to try to find a cooler spot on the bed. Hypoallergenic. While every mattress still needs a mattress protector to help protect against allergies, latex is naturally hypoallergenic, which adds another layer of protection against allergens. Pressure. While latex can be decent at relieving pressure, it is not as pressure relieving as some other alternatives, like memory foam. This depends in part on the type of latex being used (dunlop tends to be harder, talalay can be soft or firm). When trying a latex mattress, be mindful of the pressure on your shoulders and hips. When trying a latex pillow, make sure you don’t feel too much pressure on your head. Motion transfer. Once again, latex is decent at separating motion from one side of the bed to the other, but it is not as good as memory foam in this regard. Latex has a “bouncy” feel and some of that bounce can disturb your partner if you’re not careful. Latex mattresses are becoming less common in retail stores, but you can still find some online. My favorite option is from Spindle Mattress. This all-natural latex mattress is about half the price natural latex mattresses elsewhere, and they have a 365 day comfort guarantee where they’ll replace layers in the mattress for free if you’re not comfortable. (And if they can’t make you comfortable, they will even refund your money). Here is my Spindle review. Another good option is consider the Zenhaven. It’s more expensive than the Spindle, but there are a few extra “bells and whistles” that go along with it. If you’re interested in latex bedding, but don’t want a new mattress right now, here are some accessories to consider. If your mattress causes a little too much pressure, or is a little too hard, or sleeps too hot on the surface, you can add a latex topper to the mattress. Here is a two inch latex topper on Amazon that gets great reviews (though I haven’t tried it personally). If you’re tired of flipping your pillow over to the “cool” side several times during the night, or if you’re tired of buying new cheap Walmart pillows every 6 months, or if you have a dust mite allergy, consider getting a latex pillow. They tend to be fairly “springy,” but they keep a neutral temperature all night and are extremely durable. I’ve had a latex pillow since 2008, and it’s in nearly the exact same condition it was when I first purchased it. If you want to try a latex pillow, here is one on Amazon. It gets great reviews, but make sure you buy the correct version. Under “color,” you can choose high loft, low loft, firm, or plush. As a general rule of thumb, if you’re a side sleeper, get the high loft; back or stomach sleepers should get the low loft. If you have a soft mattress or like soft pillows, get the soft version. If you have a hard mattress, or like firm pillows, get the firm version. Latex is a great material in mattresses. It adds longevity, support, and temperature neutrality to any mattress it’s in. A lot of latex’s drawbacks can be mitigated by using other materials in the mattress, such as memory foam. But, the key is still to try out the mattress, check for proper support, and check for comfort. Just because a mattress has a lot of latex in it, or a blend of latex and memory foam, it doesn’t mean that it’s the right mattress for you. To see if you like latex, it might be worthwhile to get a latex pillow and see how that works out for you, and if you like it, you can be more confident in getting a latex mattress. Thank you for reading. If this guide helped you, please share it with your friends and family. You're so awesome! I do not suppose I have read through a single thing like this before. So nice to find someone with a few genuine thoughts on this subject matter. Seriously.. thank you for starting this up. This site is something that is required on the web, someone with some originality! I have been sleeping on a 100% latex mattress for 3+ years. In general I love it but it sleeps hot to me. I am almost unable to tolerate the last month of summer and wake 2-3 times/night because of being too hot. I would also prefer just a little more softness. Last winter I added a memory foam topper to my latex bed but had to remove it for summer. Now I am going to a king size bed to allow more room for my bed hog of a dog. What mattress would you suggest I look at? I've read and read and am more confused than ever. Thanks! I don't know too much about Englander other than what I've seen in some stores. I never saw an all latex mattress from them, but their innerspring mattresses didn't really appeal to me at all. One model was fairly expensive, but felt cheap and only had a 1 year full warranty. Seventeen years ago we had an Englander 100% Natural Latex mattress that was the best we have ever owned. I don't believe it was layered like they are today (and it weighed a ton)! I have heard things about Englander, like they are no longer the same company, their quality is not the same as it used to be, etc. Can you shed any light on that? I am getting low back ache every morning now on our Beautyrest "Vanderbilt", which is now several years old. Thanks for your most informative site! Great article! Super comprehensive and informative! You really helped us to make sense of the weekends of mattresses shopping and research we've done already but had become "analysis paralysis". Thank you!!! In Seattle we have a few fantastic locally made + family owned mattress stores. They are all extremely dedicated and knowledgable about their products. Seattle Mattress Company (smaller store, robust selection, less overhead costs reflected in price,) Bedrooms and More (largest selection, all flippable, patented their own process reflected in specific model prices) Everest Mattress (small store, all foam wrapped coil springs) + Soaring Heart, 6 day Mattress Company We bought our locally made mattress at SMC and our made in USA iron bed frame at BAM! As long as you've tried a really soft mattress before and liked it, the Nest Soft would be good for you. Just keep in mind that it is very soft, so it might be quite a change from what you've tried in the past. I'd expect it to be about a week to deliver to New York, but that's just an educated guess. I am a side sleeper and need a mattress. I bought one in store but it was way too firm. Now my side upper arms are hurting me and I had to return it. A hassle. You mentioned the soft love nest mattress. I'm alone 122lb and 5.6" and fairly athletic at my 69 year old age. I like what I read on the love nest side for a full mattress. Now I lost the side. Please write back asap because I have to buy a mattress now. I live in New York, What would be the delivery time frame? Yeah, that's the downside of latex. Some people have an allergy. I've been told by experts (and I am no doctor, so take it with a grain of salt) that latex is a contact allergy, and it's generally an allergy to the proteins in latex. So, if you don't touch it, you might be fine. And latex pillow manufacturers have told me that their latex goes through a special washing process to get out those proteins. On the other hand, you're unlikely to get a good night's sleep if you're worried about getting hives from your pillow, so that alone is a reason to not get it. A latex topper is kind of a bandaid solution to a mattress that is too soft. You might just need a new mattress. That said, a very firm, moderately thin (~2 inch) latex topper should help a bit. It's difficult to make a soft mattress firmer. It's easier to go the other direction. Hi. I am a back sleeper and am considering buying a latex topper for my old mattress that is too soft now(not enough lower back support). What would you recommend in terms of firmness and thickness of the topper? Thanks and hope to hear your reply soon! Usually it makes sense to match the firmness of the pillow to the firmness of the mattress, especially for side sleepers. The reason for that is that if your shoulders sink further down into the mattress, there is less of a gap to fill between the mattress and your neck, so a softer pillow will accommodate that. On the other hand, a firmer mattress will leave a bigger gap between your shoulders and pillow, so a firmer pillow is better. If you're a back or a stomach sleeper, I'd probably recommend the softer pillow regardless of the mattress. Concerning the mattress topper and pillow you linked to on Amazon - would the plush or firm pillow match the firmness of mattress? Thank you for this informative article!